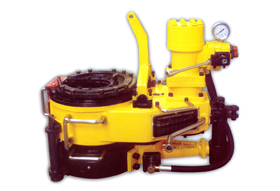 The open type LH115 hydraulic foot clamp is a component of geological wireline core drill. It is used to clamp or loosen the drill rod. This hydraulic foot clamp is composed of main clamp and back-up clamp. The main clamp and back up clamp form a linkage system. By operating the manual directional valve on the main clamp, we can make the back-up tong to clamp or loosen the drill rod at the same time. Hang up the main clamp. The back-up clamp floats under the main clamp and joint the main clamp through quick connector. There are two speed grades in this clamp. Arrester and steering controller are set on the clamp head. 1. This geological wireline core drill part is light and has a compact structure. Clamps are easily transported. 2. It is quite flexible to operate. Its performance is very stable. 3. There is large difference between the two speed grades. The top speed stage has a higher speed while the low speed stage has large torque. 4. The hydraulic foot clamp has an integrated retarding disc which makes the slips clamp the drill rod joints more efficiently. 5. Functions of the arrester and steering controller are accessible. They are easily to install, adjust, use and maintain. 6. Main clamp and back-up clamp are easily used alone or in combination. Connect the hanger with main clamp hanging bar of the geological wireline core drill at first. Put the hydraulic foot clamp on the load-bearing point of the drill tower. The hanging point should be over 15m above wellhead. The clamp head of the hydraulic foot clamp is 0.5mm above wellhead. Suspension height should be appropriate to make sure the clamp clasp the drill rod subs.